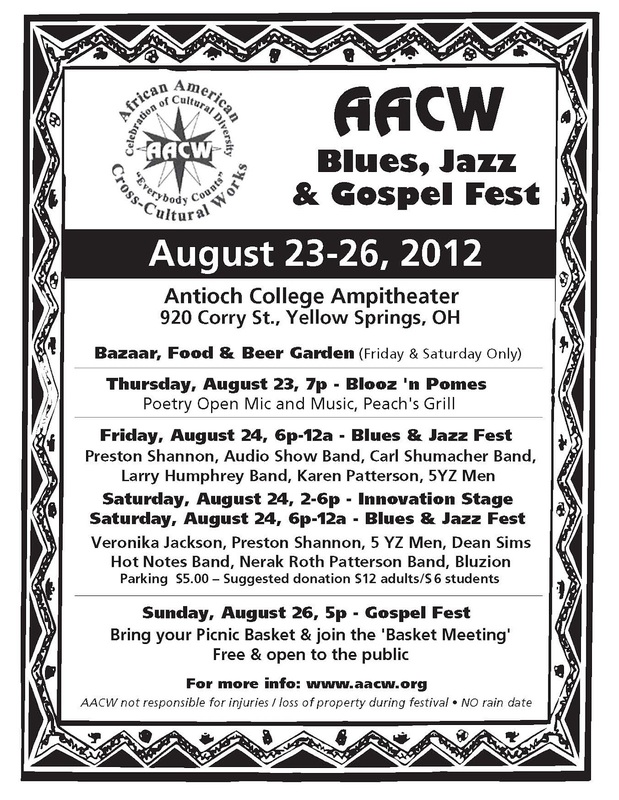 AACW presents the 15th annual Blues and Jazz festival. 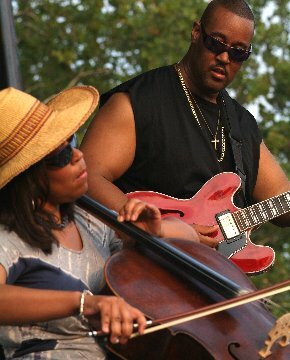 The festival will begin August 23 at 7:00 pm at Peach’s Grill 104 Xenia Avenue, Yellow Springs, Ohio featuring Blooz ‘n’ Pomes. This will be a poetry open mic open to the public. Poets will be backed by a blues band featuring headliners from the festival. Blooz ‘n’ Pomes will continue until the poets and musicians run out of words and music. On Friday, August 24, the festival will move to the Antioch College Amphitheater on Corry Street in Yellow Springs. There will be a variety of vendors as well as the following performers: Audio Show Band, The Carl Schumacher Band, Karen Patterson and the 5 YZMen, The Larry Humphrey Band and Preston Shannon. 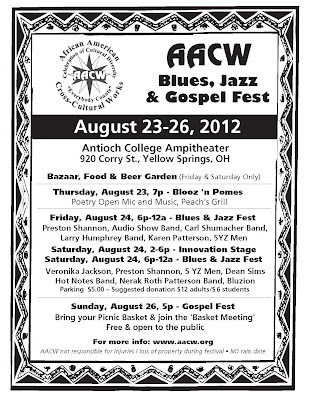 Saturday, August 25 will begin at 12:00 pm to 2:00 pm with a blues workshop hosted by Festival Performing Artists. This will be followed by Innovation Stage performances by a variety of area musicians from 2:00 pm to 5:00 pm. Evening performers include: Dean Sims Hot Notes Band, Preston Shannon, Veronica Jackson, Nerak Roth Patterson Band and the 5YZMen. The festival will culminate on Sunday August 26 with a Gospel Fest and Basket Meeting. The Gospel Fest will consist of live performances from local, national and international gospel artists. The Basket Meeting is basically an old time community tradition similar to a community potluck where participants are encouraged to pack a picnic lunch and socialize.